If you were recently injured, in addition to coping with your injuries, you may be extremely worried. Who will pay the hospital bills? Who will pay for my lost wages? Will my life get back to normal? Who can I trust? While the specific answers to these questions vary with each case, you can rest assured there is help available. Whether you are an injury victim in a car or truck accident case, a wrongfully injured patient due to medical malpractice, or if your loved one was harmed due to nursing home abuse, our Chicago personal injury lawyers are here for you. Oftentimes, after an injury, you will be pitted against an insurance company. If you are up against a trucking company, a hospital, or a nursing home, chances are these business are represented by large insurance companies with deep pockets. These insurance companies hire skilled attorneys and claims adjusters whose only job is to save the insurance company money. Their goals are to lowball your injury costs, or not pay them at all. It is extremely difficult for an individual to stand up alone to these large-scale insurance companies. We feel it is vital that personal injury victims have a knowledgeable and experienced law firm on their side. Our personal injury lawyers in Chicago have over 50 years of combined experience in fighting for injured victims just like you. We put our resources and our skilled attorneys on your case to help you win the maximum compensation you are entitled to. When you have not one, but an entire team of skilled injury lawyers working on your case, large-scale insurance companies are forced to pay every penny an injured victim may be entitled to. Feel free to call the personal injury attorneys at the Dinizulu Law Group, Ltd. with your questions. We can be reached at 1-312-384-1920 or 1-800-693-1LAW. If you experience any of these symptoms, especially after a blow to the head or being violently shaken, you should go to the emergency room immediately. You may have bleeding in the brain that needs immediate medical attention to prevent more serious injuries or even death. 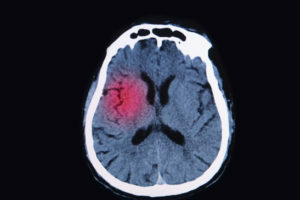 A CT Scan or MRI may show the bleeding. When another person or company caused the TBI, you should contact the Dinizulu Law Group, Ltd. quickly so we can start working on your case. 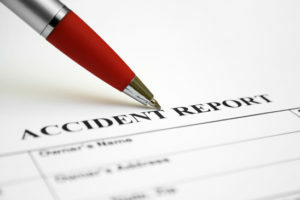 Remember, there is a set time period in which an injury claim must be filed. A timely and well-put together case helps you get the maximum compensation you deserve. Contact our personal injury law firm in Chicago at 1-312-384-1920 or 1-800-693-1LAW. If you have suffered a spinal cord injury, the significance of the injury to the spinal cord depends on many factors. If you were injured in the “cervical” vertebrae—the 7 vertebrae at the top of the spinal cord—you could be paralyzed from the point of injury downward. A person whose spinal cord is severed or compressed at the cervical level is known as a “quadriplegic.” If the break is at the third cervical vertebrae (C-3) or higher, the victim will usually require artificial means of breathing for the rest of his or her life. If the break is at the C-4 level or below, the person will be able to breathe on his or her own. If the break is at C-7 (the lowest of the cervical vertebrae), the injured victim is considered to be functionally independent, even though he or she cannot fully move his or her fingers. Below the seven cervical vertebrae are the 12 “thoracic” vertebrae and five “lumbar” vertebrae. A spinal cord injury at a thoracic or lumbar vertebrae results in paralysis below the point of injury. A person who is paralyzed from the thoracic or lumbar vertebrae down is known as a paraplegic. 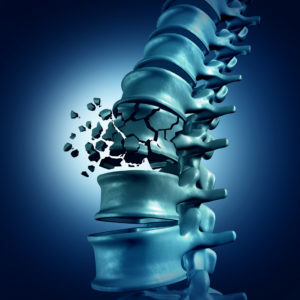 Spinal cord injury at any level of the spinal cord is a devastating injury having a major impact on the person’s physical abilities and enjoyment of life. The victim of a spinal cord injury must also face the increased risk of developing bedsores (decubitus ulcers) that can become infected and life threatening. Spinal cord injury victims—especially quadriplegics—are also at increased risk of developing pneumonia, which can be fatal. If you or a loved one has suffered a spinal cord injury, contact our experienced personal injury lawyers in Chicago. We understand the complexities of spinal cord injuries and their associated problems. Let us help you or your loved one get the maximum monetary compensation you are entitled to. To schedule a free initial consultation, call our office at 1-312-384-1920 or 1-800-693-1LAW. Amputation is the removal of an injured or deceased body part. Some amputations are due to medical conditions, such as diabetes. 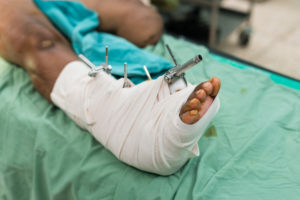 In injury cases, amputation can be the result of an automobile crash, a misdiagnosis, a defective product, or other causes. A person who has suffered an amputation due to the carelessness of another or a defective product will often suffer psychological injuries for years after the limb has been amputated. After a limb or other body part has been amputated, the person will suffer severe pain, which will take several months to dissipate. One phenomenon that may occur for years is the “phantom limb syndrome,” in which the person will feel pain and other unpleasant sensations in the amputated limb, even though the limb is no longer there. Accidents causing amputation of a body part may not only cause physical and psychological injuries, it will often cause inability to enjoy activities the person engaged in prior to the amputation (“loss of enjoyment of life”) and prevent the injured victim from participating in many enjoyable activities he or she engaged in prior to the amputation. Therefore, it is important for personal injury firms to understand the full scope of the injury and what can be done to compensate a person for this injury. Would this procession involve physical and psychological therapy? Can the injured victim recover full use of his limbs through prosthetics? While there have been great advances made in prosthetic limbs, for an injured victim to get maximum benefits from the latest medical technology, he or she must receive fair and rightful compensation. Our skilled injury lawyers in Chicago have over 50 years of combined experience that we put to the test every day to help injured victims just like you. While many injury lawyers in Chicago may take your case, we are also personal injury trial lawyers. Meaning, depending on the circumstances of your case, your case may need to go to trial. When this happens, we have the resources and expertise available to represent your case in the best light possible to a trial jury. Call us at 1-312-384-1920 or 1-800-693-1LAW to schedule a free initial consultation. Severe burn injuries are one of the most devastating types of personal injury, and is the third-leading cause of unintentional death in the United States, behind only automobile accidents and falls. Third degree burns involve the destruction of muscle, tendon, and ligament damage, and also cause severe disfigurement, which subjects the burn victim to feeling like a monster in public, when people see his or her disfigurement and quickly turn away to avoid looking at the person. There are a number of types of burns, the most common of which are thermal burns, which are caused by fire. The person’s skin may be burned deeply, and there are also damages to the lung due to inhalation of heat or smoke inhalation. Other types of burns include friction burns, such as when a motorcyclist or bicyclist is hit by a car and is dragged a number of feet; electrical burns and electrocution; chemical burns caused by acid and other caustic substances; and radiation burns, which are caused by exposure to the sun and tanning booths, X-rays, radiation for treatment of cancer, and nuclear medicine. If you have suffered a severe burn injury because of another person’s fault, you have the right to bring a personal injury lawsuit against that person. If he or she was working for a company at the time of the injury, you also have the right to sue his or her employer. 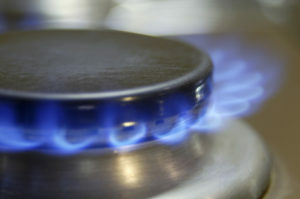 In a lawsuit against another person or company for inflicting serious burn injuries on you, you have the right to be monetarily compensated for all of your medical expenses, including medical procedures such as reconstructive surgery you will have to undergo in the future, lost wages due to your inability to work, pain and suffering, emotional distress, and loss of enjoyment of life. It takes a knowledgeable and experienced personal injury lawyer on your side who will take account of all your needs, whether there are present or anticipated future needs. The negligible party may fight tooth and nail to not give you full, fair and complete compensation. The Chicago personal injury lawyers of the Dinizulu Law Group, Ltd. understand the needs of injured victims just like you. With over 50 years of combined experience, our personal injury attorneys in Chicago know the tactics insurance companies and defense attorneys use to make your needs seem frivolous, even though they are responsible for your harm. Getting justice and fair compensation for our clients is what we do. Our verdicts & settlements show these results. Contact our office at 1-312-384-1920 or 1-800-693-1LAW to schedule a free initial consultation.